Most likely, I am writing this post for myself, but by the off-chance that you are a regular reader or shopper, you may be wondering what we’ve been up to lately. As if my shop hours aren’t irregular enough, lately I’ve been even more M.I.A. than usual with the shop door closed up and no sign nor notice of opening up any time soon. Well, I promise we’ve not been lounging on the beach sipping peach mojitos and working on our tan lines…although that sounds ideal. Instead, we’ve been pursuing the ever scandalous title of “slum lord and lady” by purchasing a foreclosure house with overly ambitious dreams of fixing it up to hipster-living standards on an unrealistically cheap budget…heavy sigh. The house is an ugly reminder that not all things “retro” or “vintage” are desirable or attractive. Shag carpet and popcorn ceilings may come back in style one dark, apocalyptic day, but I’ll take my chances and feel secure in my decision for removal. With all due respect to the house, it does have good bones underneath the faux wood paneling and cheap, dated linoleum. 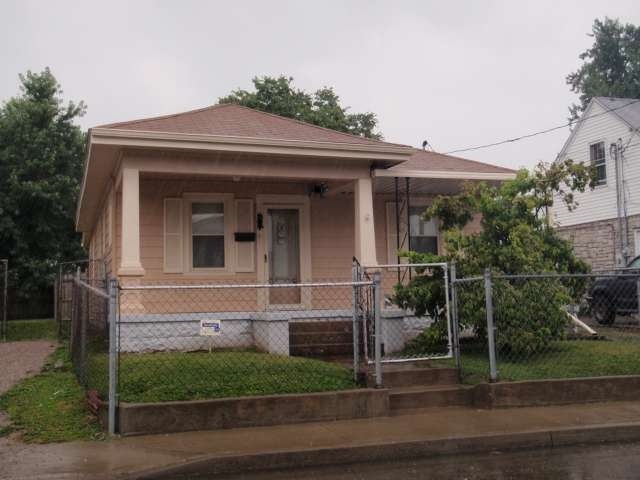 It’s a 1920’s bungalow, single story with approximately 1,100 square feet, 2 bedrooms, one shamefully dingy bath, a den, large eat-in kitchen, and attractive detached garage. It has a nice, big covered front porch that just begs to be adorned with a vintage metal glider for lazy summer evenings and a fenced yard great for the containment of a furry companion…but those are all the good things I can squeeze out of this generous description. Although Chaddy Daddy and I agree on most things, our ideas for the house differ greatly. Being more business savvy and numbers-oriented than I, Chaddy Daddy saw this as a basic turn-key rental with a few necessary updates such as a deep cleaning, new locks, and HVAC. I, on the other hand, saw this as a project house with every intention of restoring it to its former 1920’s charming self, complete with vintage appliances, porcelain sinks, and aluminum-trimmed laminate counter-tops. Of course, I quickly realized, with Chaddy Daddy’s incessant reminders that this wasn’t possible, nor realistic, on the budget we had agreed to if we had any chance of making our money back in this lifetime. A girl can dream, right? So we’ve compromised and I’m going to have to find creative ways to turn this beast into a beauty without breaking the bank. Although not the most creative, nor exciting way to do this is referred to as “sweat equity”, meaning doing as much of the work as possible on your own. This may sound fun at first to all you aspiring do-it-yourselfers, but try pulling ten thousand carpet staples out of oak hardwood flooring by hand all sunny Saturday afternoon and one’s definition of “fun” rapidly redefines itself (see earlier vision of sipping peach mojitos on the beach). Now let us move on to the rest of the house…if you can stomach it. Bathing in the tub may require an updated tetanus shot and result in being even dirtier after a shower than before. As if the particle board base of the fiberglass, sea-shell shaped sink isn’t enough, the clash of faux gray, marbled wall paneling with the clammy-colored bath tile tops it off while attempting, in vain, to offset the puke-green paint and palm tree decals. The solid-wood Maple cabinets aren’t bad and may be redeemable under the inch-thick layer of grease and grime. The den floors were discovered to be level concrete underneath which, although ugly, is a good, solid base for attractive tile or modern flooring. A charming arch leading from the front room to the middle room is one of few redeemable qualities of the house. The front room is cute with a small, but of couse non-working fireplace. Now that you’ve seen the Nightmare, it can only get better from here, right? That’s my hope. 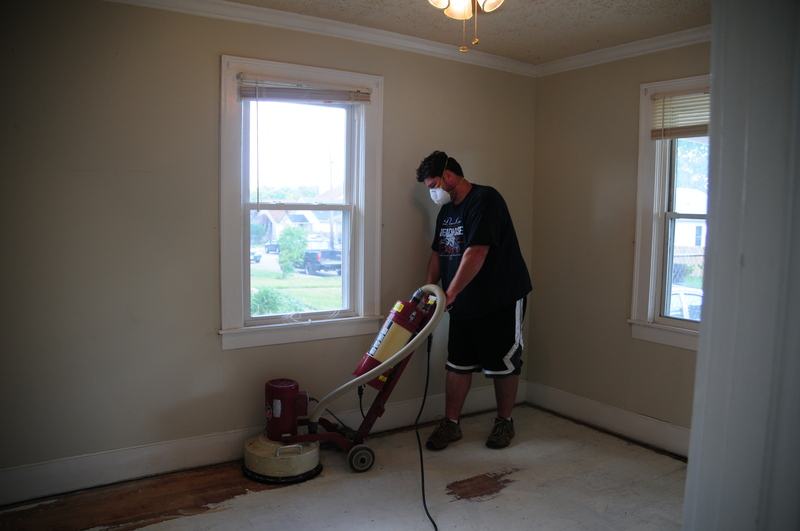 HVAC is being installed and the hardwood floor doctors have been called in for emergency floor repairs in an attempt to save the wood beneath from the hideous paint job. The floor furnace is being removed and patched over with hardwood so Child Based Services won’t lock me up after the first prospective tenant’s newly-mobile toddler sautees its tender toes to well-done while learning to walk, and those awkward two-toned kitchen cabinets are living on borrowed time. I look forward to the fun parts, like picking out paint colors and tile samples, and putting it all together to see a vision manifest beautifully. Stick it out with me and stay tuned for updated posts and pictures on the progress. Send me your thoughts, suggestions, laments, criticisms, “girl, what the hell we’re you two thinking?” comments, and what ever else you can think of. Who knows, she may be so cute in the end that the rental applications come flooding in by the dozens! But then there I go, unrealistically dreaming again :)….